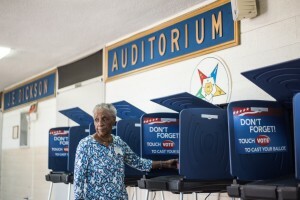 Should primary voters be worried about aging voting machines? NEW YORK – As this year’s presidential primaries move beyond the First Four states of Iowa, New Hampshire, Nevada, and South Carolina, and into the dozen “Super Tuesday” states voting on March 1, millions of Americans will find themselves exercising their right to vote on computerized machines from the pre-iPhone era running on software like Windows 2000 with hardware like 512 kilobyte memory cards. “It’s concerning because this is the infrastructure for our elections,” said Lawrence Norden, co-author of America’s Voting Machines at Risk, a recent Brennan Center for Justice report found 43 states have counties using voting equipment 10 to 15-years-old. An ‘impending crisis’ on Election Day? His concern is bolstered by what happened in the 2012 general election, when an estimated 500,000 to 700,000 people did not vote because of long lines, according to a study by the Caltech/MIT Voting Technology Project, Waiting in Line to Vote. The study found average voter wait times on November 6, 2012, ranged from a minute-and-half in Vermont to 39 minutes in Florida, though reduced early voting days and long ballot referenda text contributed to the lines. With 8,000 separate election jurisdictions using equipment of their own choosing, the recommendation that states increase the number of voting machines and poll workers is easier said than done. The CalTech/MIT study was commissioned by the bipartisan Presidential Commission on Election Administration, which issued its own report in 2014 forecasting “an impending crisis” with voting machines. The machines in need of replacement were purchased following the disputed 2000 presidential election between George W. Bush and Al Gore, when a recount of the Florida vote was stymied by the state’s use of punch cards at the polls. After the election was settled, in 2002, Congress passed the Help America Vote Act (HAVA) which appropriated $3.6 billion for states to buy new electronic voting equipment. Initially, about 70 percent of the machines purchased were ATM-style touch screens, but by 2008 shrinking confidence in their reliability led to states like Iowa, New Mexico, Maryland and Florida to pull the plug on them. Now touch-screens facilitate less only one-third of registered voters, with two-thirds of registered voters using optical scannersthat read voter-marked paper ballots, according to a November 2015 summary by Election Data Services. “Due to aging machines, we are seeing some strong movement away from the electronic systems to the optical scan systems in the past six months,” said EDS president Kimball Brace. In Texas, the biggest Super Tuesday prize, more than 40 percent of the counties will use voting machines that are 10 or more years old, according to the Brennan report, while Travis County – Austin – bought its machines in 1999. Georgia purchased 88 percent of its machines in 2002. In Arkansas, machines in 80 percent of the counties are a decade old, as are the machines in 95 percent of Tennessee’s counties. Looking ahead to the March 15 primaries, around 90 percent of Ohio’s and North Carolina’s counties use touch screen machines that are 10 or more years old. In Florida, one-third of the counties use decade-old machines. Masterson said backup plans range from keeping spare machines in roving trucks that can be sent to a precinct in need to poll workers stocking paper ballots that can be filled out and counted by hand. Norden said his survey of elections officials found it was common for them to cannibalize old machines and scavenge eBay for replacement parts, particular for machines that are no longer manufactured. “There are security vulnerabilities associated with using machines that are so old,” Norden says. In 2015, Virginia’s election board decertified 3,000 touch-screen machines in its largest county, Fairfax, after an independent examination found the machines could be hacked. Virginia Governor Terry McAuliffe requested $28 million from the state legislature to replace old machines statewide, but last year legislators turned him down. Arkansas scaled back a $30-million-plan to replace its machines and instead spent $2.5 million last year for new machines to be deployed Tuesday in only four counties. This month, Michigan governor Rick Snyder proposed spending $10 million of the state’s leftover HAVA funds to replace decade-old optical scanner vote-counting machines. Maryland is one of the few states using all-new machines this year. Colorado has begun a three-year plan to roll out new optical scanners that are already in use in Denver. A dozen Florida counties have announced a plant to jointly purchase new voting machines before November. In a written statement, the nation’s leading voting machine manufacturer, Nebraska-based Election Systems & Software (ES&S) said it was working to ensure the sustainability of its machines. “We have voting systems which have performed well for 15-plus years and work constantly to ensure the software used meets present day standards,” said Kathy Rogers, ES&S senior vice president of government relations. Rogers said the company runs a helpdesk for election officials to call and deploys field technicians as needed. “Preventative maintenance, proper storage, and pre-election testing is the key to longevity with any system, and ES&S works to provide our customers with resources in these areas,” Rogers said. Masterson conceded few Americans have computers running on technology as old as their voting machines, but he believes there won’t be a voting machine meltdown during the primaries or in November. “Machines that are three years older than the iPhone pose a challenge that needs to be addressed moving forward,” he said.